Harlow New Town was established in 1947, when the New Town Development Corporation began to purchase land around the old town and erect new housing estates. The houses primarily served to relieve housing pressures on bombed-out, overcrowded London, particularly from the East End. The first residents began moving in from 1949. So say the textbooks, but what personal stories lie behind these brief facts? At the Essex Sound and Video Archive, we hold a wonderful collection of oral history interviews conducted by Dr Judy Attfield in the 1980s for her research project, Harlow Housing and Design (SA 22). These interviews reveal what it was like to live in the new town. Our Heritage Lottery Funded project, You Are Hear: sound and a sense of place, has enabled us to digitise all of the original cassettes and make them freely available through Essex Archives Online. A satisfying sight: the icons show that there is audio material attached to that catalogue entry. At first, we thought the digitisation would be a straightforward task. Shortly after the collection was first deposited with us in 1996, we created access copies on cassette, to safeguard the original masters (our standard procedure in the Sound Archive). The access copies are all neatly labelled and clearly identified, one cassette per interview. However, when we looked in the box containing the original cassettes, things were not quite so straightforward. We digitise from the original recording (or as near to the original recording as we can get), to capture the purest sound. On revisiting the masters, we realised that the interviewer had used one cassette for multiple interviews – a common practice when you want to make the most of the cassette tape you have. Piecing each recording together to make one complete interview has caused our digitiser, Catherine Norris, several headaches. But now they are all digitised. Similar to our procedure with physical analogue recordings, we keep a master, uncompressed .wav file safely in storage. We then create compressed .mp3 copies as our new access copy. You can still come into the Searchroom and listen to the recordings, but you can also now listen from home, through Essex Archives Online. Each interview is valuable in its own right, but as a collection it is even more fascinating. Dr Attfield spoke to a range of people: developers, architects, and town councillors who shed light on the planning of the new town; shopkeepers; people who moved to Harlow before the new town; and people who moved as part of the new town settlement. Putting these different viewpoints together gives a rich, rounded impression of this time in history. Some interviewees say that women found it more difficult than men to settle in new towns and felt lonely and depressed; some say that women found it easier to form new bonds because they were surrounded by women in a similar position, raising children away from their parents in unfamiliar surroundings. Some were ecstatic to have their own front doors, their own staircases in two-storey homes; some missed the familiarity of London, even if they were living in cramped, shared housing. The multiplicity of memories challenges generalisations about life in a new town. It also demonstrates (by listening to the accents of the interviewees, if nothing else) that not everyone in Harlow in the 1950s was an ex-Eastender. The collection also serves as a good example of how to conduct an oral history interview. Dr Attfield had a specific interest in the interior design of the new houses. She directed questions to gather information on this topic. However, she also asked wider questions for context. She let her interviewees say what they wanted with minimal interventions, but also guided the interview to cover her set of questions. Occasionally she probed her interviewees for more details, or challenged their viewpoints to get a better understanding, without revealing any judgement of their opinions. Dr Attfield made a significant research contribution in the fields of material culture, gender studies, and design history, among other overlapping areas. Based for many years at the Winchester School of Art, her book Wild Things: The Material Culture of Everyday Life (Oxford: Berg, 2000) has become a key text in her field. She passed away in 2006. 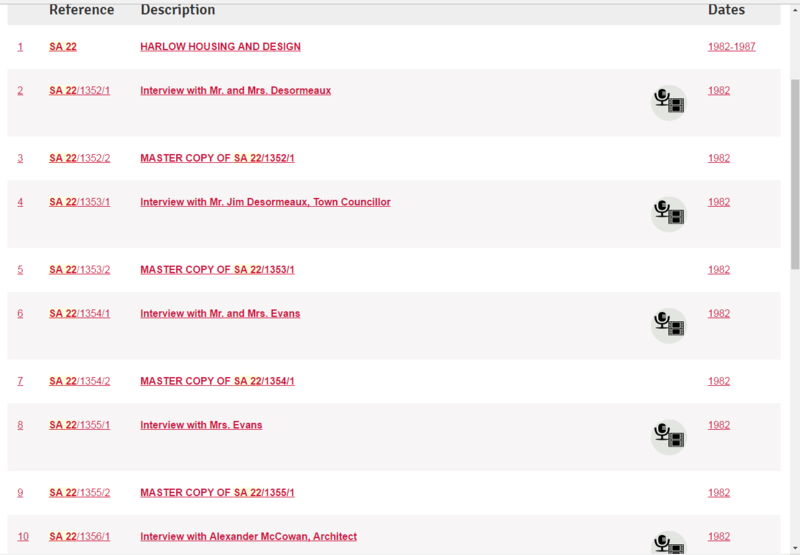 We are very grateful that she deposited her recordings about Harlow with us, for future researchers to use and enjoy. One particularly moving interview from the collection is that with Mrs Summers, who moved to the new town from Walthamstow in 1952 (SA 22/1364/1). At several points in the interview, Mrs Summers describes the long adjustment period when ‘home’ still meant London before completely settling in Harlow. As well as missing her family, in this clip she describes how she ‘couldn’t get used to the newness of things’ after coming from Walthamstow with its ‘houses with big windows… little tiny houses… nice houses… [and] grubby-looking houses’. At a time when neighbourhood plans for vast numbers of additional houses are being developed across Essex – across the country – perhaps these experiences of new settlers can help with the process of creating new communities. Dr Attfield published an article based on these interviews in the book that she co-edited with P Kirkham, A View from the Interior: Women and Design (London: Women’s Press, 1995). The article can be consulted at Colchester Library. With the World Cup in full swing in Brazil, we look back to the glory year of 1966, when the World Cup came to Essex. The team from Uruguay stayed near Harlow for the duration of the World Cup. They arrived on 1 July 1966 and stayed at the Saxon Inn (now the Park Inn by Radisson Harlow). The Epping and Ongar Gazette reported the team’s arrival. The following week the paper reported that the team would make an unexpected public appearance at the local cinema to thank the town for the warm welcome which the players had received. It has been stated that Harlow Town FC arranged a friendly match against Uruguay, and that they were defeated, 6–1, but we have not been able to find a press report of the match. Do you remember a match between Harlow Town FC and Uruguay? Do let us know if you have any memories, photographs or programmes of this match. While preparing for our Discover Parish Registers workshop at Harlow Archive Access Point on Wednesday 14 May 2014 (see our events page for details), I came across a note that the registers of St Mary Magdalene, Harlow had been closed as they had been taken to the Sandwich Islands (now Hawaii) by mistake and were not returned for two years, by which time new registers had been started. Intrigued, I investigated further and found that the perpetual curate, Revd William Raymond Scott, had undertaken to accompany the newly-appointed Bishop of Honolulu to the Sandwich Islands, as Hawaii was then called, in 1862. In addition, he and his wife were to chaperone 70 girls emigrating to Australia. They sailed on the steamer the Tynemouth and the voyage was a disaster from start to finish. The crew mutinied in mid-Atlantic and the ship had to put into the Falkland Islands. Order was restored and the ship continued to Victoria. On arrival Scott would not let the girls leave the ship due to the ‘moral dangers’ ashore. He continued on to the Sandwich Islands and was present when the King and Queen of Hawaii were confirmed and received their first communion. The service was translated into the Hawaiian language and sung. He established a church on Maui and a school but left the islands in disgrace and returned to England where he ministered to the poor in the East End of London including Wapping Workhouse during a cholera epidemic. He died in 1894 in Marlborough, Wiltshire. 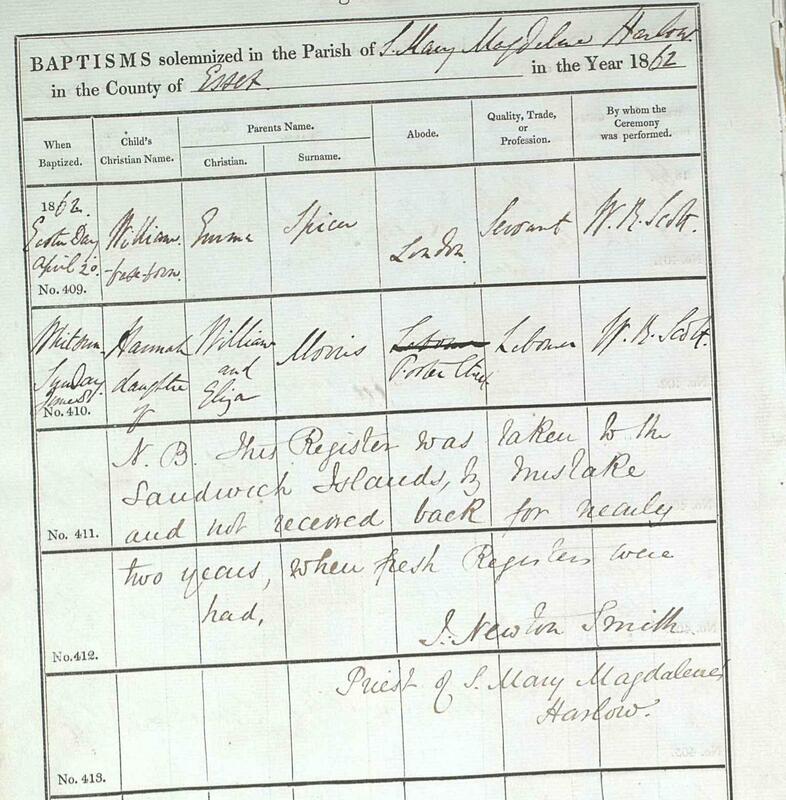 To find out more about parish registers and how they could help your research, coming along to one of our Discover: Parish Registers workshops. There are two coming up soon, at Harlow on Wednesday 14 May, and at Walton-on-the-Naze on Wednesday 21 May. Find out more here.